I love a combination of sweet and spicy, so these layered Sweet Potato Tostadas fit the bill. Also, this is a great meal to make that allows your family members or friends choose their own toppings! 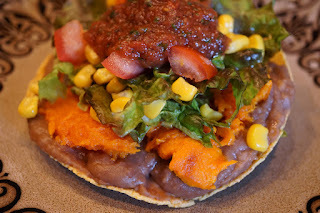 * To bake your own OIL-FREE tostada shell/base, preheat oven to 350 degrees. Place tortillas directly on rack and bake for 13-16 minutes, until lightly brown, watching them closely so they don't burn. Test to see if they are done by pinching off the edge of one. If it's crispy, they're ready! SOOOO can't wait to try this!!! SOON! Dana...Enjoy! You will love it! OMG......these were unbelievable, so yummy!!! Now this is fast food at its finest!!! !